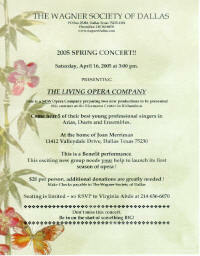 This exciting new group needs your help to launch its first Season of Opera! Don't miss this concert! - Be in on the start of SOMETHING BIG! Please RSVP to make sure you have a chair! Welcome to The Wagner Society of Dallas. You know, as Texans, we're bound to strive for being the biggest and best of all the Wagner groups in the world over. My hope, in addition, is that we ensure your attendance and participation by offering an interesting, stimulating, and enjoyable array of meetings, recitals, and travel. Let us know if you have suggestions for future activities, and do make an effort to join in during the coming months with your membership, attendance, and above all joy of being with fellow Wagner aficionados. 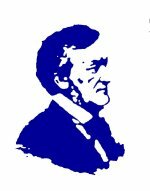 The Wagner Society of Dallas is devoted to furthering the enjoyment and appreciation of the music of Richard Wagner. The Dallas group is one of many Wagner Societies all over the world. It is a non-profit organization open to anyone who enjoys the works of Richard Wagner and who would like to participate in the Society’s activities. The Wagner Society of Dallas has monthly meetings and programs which feature recitals, lectures, video screenings, receptions for opera singers and personalities, and trips to Wagner performances in other cities. We welcome music lovers who are already familiar with Wagner’s works as well as those who may want to become more knowledgeable about Wagner’s music. Member Benefits include attendance at programs, our newsletter, discount on books and CD’s, advance notice of events and selected ticket services, receipt of the Membership Directory, ticket allotments to Bayreuth, and an active link with fellow Wagnerians throughout the world. 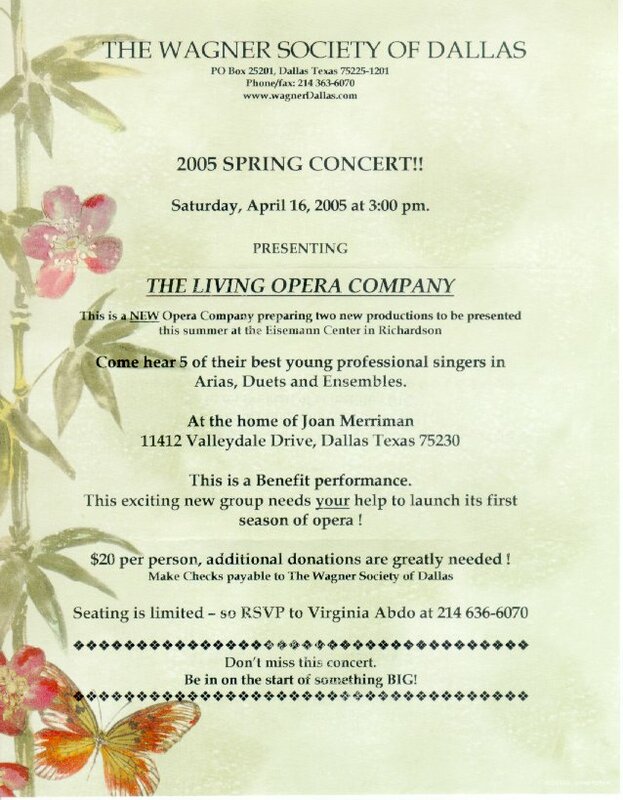 Many Wagner Society of Dallas members fondly remember Sheila Jones Harms, who was an active member of the organization, and who presented many interesting programs and recitals over the years. Now, WSD member Ed Flaspoehler has completed his biography of Sheila, called The Cold War Soprano: Memoirs of a Singer-Spy. 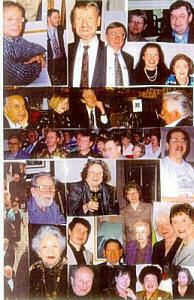 If you are interested in opera and fine singing, Sheila's biography will surely be of interest to you. Not only will you get an inside glimpse of what it takes to become an opera singer, and learn about the world of opera in Post- WWII Vienna, but, because Sheila and her husband Werner, were also CIA agents, you will get a look at the Cold War from a personal point of view.